Ramanath Hegde is a Postdoctoral Fellow at the Institute of Protein Biochemistry in Naples, Italy, where he investigates ways of preventing cells from destroying mutant proteins. He maintains his original interest in engineering through a variety of hobbies, including carpentry. 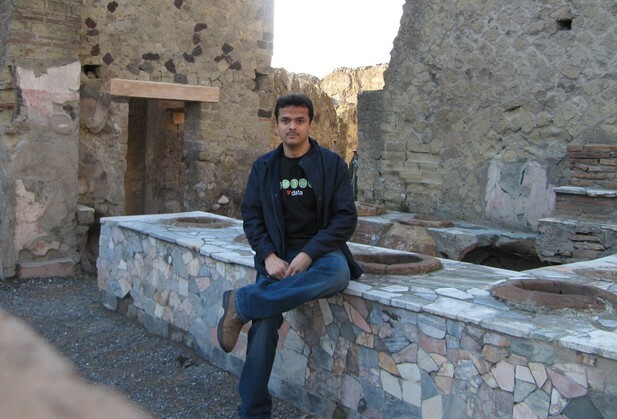 Ramanath Hegde at Scavi archeologici di Ercolano, Napoli, Italy. Image credit: Dr. Juan Jung. How did you become interested in studying biology? I grew up in a house in the middle of a thick rainforest, in a small village in the western ghat region of Karnataka, India. I spent my time appreciating and wondering about Mother Nature, making toys, art and furniture, helping my father farm and learning to cook from my mother. When I was at high school my interest in TVs, cars and trucks made me think of becoming an engineer, but what later impressed me were the cells that build an organism, and how they build and maintain themselves. During my undergraduate and Masters studies I was interested in studying how proteins are transported within cells. This interest evolved into my current research on proteostasis – the biological pathways that control protein folding, trafficking and degradation within cells. There are many genetic mutations that result in misfolded proteins. Some of these proteins can still work if they reach their proper destination, but proteostasis degrades them before they get there. If we understand how proteostasis removes the mutant proteins, we could try to alter proteostasis to allow these proteins to reach their proper destination. Then, we may be able to cure genetic diseases like cystic fibrosis and Wilson’s disease (a condition where copper accumulates in the body). Cystic fibrosis is caused by mutations in the gene for CFTR, which is a protein that sits in the cell membrane, and controls the movement of salt in and out of cells. Like in any other manufacturing factory, cells have quality control processes, and in cells these quality control processes remove faulty proteins. I study how CFTR quality control is regulated in order to devise a new tool to ‘cheat’ this control. This would allow the CFTR channels to be more efficiently trafficked to their proper places in the cell, and so reduce the symptoms of cystic fibrosis. We found that several known very weak or clinically uninteresting drugs that rescue the mutant CFTR protein from degradation commonly changed the expression of several genes (Hegde, Parashuraman et al., 2015). Many of these genes were involved in major signalling pathways that control how the mutant CFTR protein folds and is transported within a cell. We found that modulating these signalling pathways stops the degradation of the mutant CFTR proteins. Moreover, modulating these pathways also restored the function of the other mutant protein that causes Wilson’s disease. We are currently using two approaches to try to discover better and more efficient drugs for treating cystic fibrosis and Wilson’s disease. Firstly, we are searching through hundreds of drugs which are currently in clinical trials for a variety of other diseases to find any that may modulate the signalling pathways we discovered. Secondly, we are using drug gene signature databases to identify drugs that specifically target the groups of genes that we identified. We will then test the effectiveness of the discovered drugs in more relevant models of patient cells. What have been your best moments during your research? When we found a few drugs that were more efficient than Lumacaftor and synergize with it, and when I received the email saying that eLife had accepted our article for publication. It was discouraging to see that a few of the drugs we discovered did not increase salt transport as expected. Who/what has most influenced your career so far? Although I consider myself as just a student of science, when I meet members of the public and explain to them what I do, they see me as a life scientist who could solve the healthcare problems mankind is facing. Those hopes and expectations drive me in my career. What changes would most improve the way that science is done today? There must be better partnerships and co-ordination between industries and educational research institutions. We must interact more with the public to make them aware of the importance of research. We must encourage the scientific community to publish papers about things that did not work for them. This would mean that if 10 people find that something doesn’t work, the 11th person may not have to repeat it as well. This might save a lot of effort and funding. I would like to see more independent funding and fellowship opportunities for early career researchers, like EMBO long-term fellowships and HFSP postdoctoral fellowships. How do you think the support for science in Italy compares with other countries? I hear that funding for the scientific research has been reduced in Italy like many other countries. I guess only exceptional projects are getting funded. Carving, carpentry, cricket, cooking and photography. An entrepreneur in the healthcare sector. Yes, she is a PhD student studying the roles of microRNAs in eye development and diseases. We met through one of our common friends, and liked each other. I am a life science student but at the same time I like to keep track of progress in mechanical engineering and electronics. When I visit my parents on vacation, I still use the reading table and sofa that I made myself 12 years ago. Though they are good, I feel I could now make something better and more unique.